The new MacBook Pros are here, and as expected, the 15 and 17-inch models are loaded with Intel's Core i5 and i7 processors and new display options, but the 13-inch model stays behind with a Core2Duo and an unchanged price. So while pricing on the 13-inch models remain the same, the base MBP 17 drops to $2,300 ($200) while the base MBP 15 actually gets $100 more expensive at $1800. All new models come with a base of 4GB of RAM (expandable to 8GB). Core i7 processors are options for both the 15 and 17-inch models, which include NVIDIA's GeForce GT 330M discrete graphics—considered to be mid-range notebook graphics cards (see benchmarks here). Meanwhile, the 13-inch MBP includes a custom-made NVIDIA 320M GPU. Interestingly, the 15 and 17-inch MacBook Pros will use a new, proprietary system to swap between discrete and integrated graphics based upon what processes you're running in OS X—a technique somewhat similar to what we've seen from NVIDIA's Optimus system. Also of note, the 15-inch model now has three display options, a 1440-by-900-pixel LED-backlit glossy display, a "high-resolution" 1680-by-1050 glossy ($100 upgrade) or an "antiglare high-resolution" display ($150 upgade). 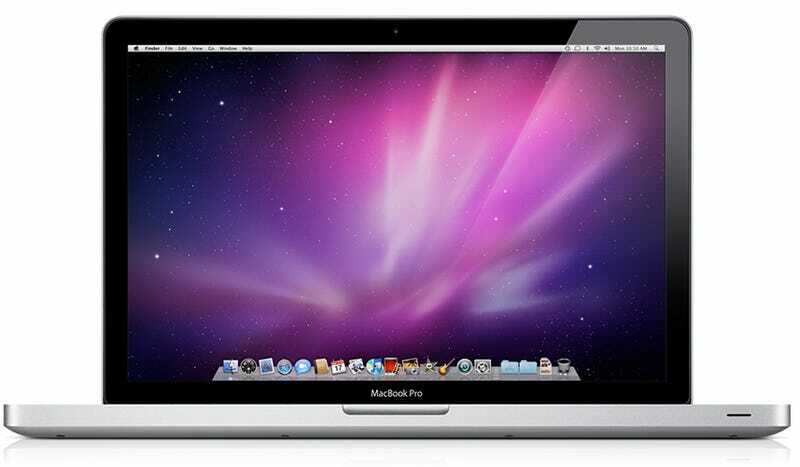 The MBP 17 comes with the high resolution screen stock and can be upgraded to antiglare for $50. And a slightly reformulated battery is supposed to balance the power requirements of the new chipsets. * 60 Watt MagSafe® Power Adapter. Build-to-order options for the 13-inch MacBook Pro include the ability to upgrade to 8GB 1066 MHz DDR3 SDRAM, a 320GB 5400 rpm or a 500GB 5400 rpm hard drive, a 128GB, 256GB or 512GB solid state drive, Mini DisplayPort to DVI Adapter, Mini DisplayPort to Dual-Link DVI Adapter (for 30-inch DVI display), Mini DisplayPort to VGA Adapter, Apple Remote, Apple MagSafe Airline Adapter and the AppleCare® Protection Plan. Build-to-order options for the 15-inch MacBook Pro include the ability to upgrade to 8GB 1066 MHz DDR3 SDRAM, a high resolution 15-inch 1680 x 1050 display in glossy and antiglare, a 500GB 5400 rpm or 500GB 7200 rpm hard drive, a 128GB, 256GB or 512GB solid state drive, Mini DisplayPort to DVI Adapter, Mini DisplayPort to Dual-Link DVI Adapter (for 30-inch DVI display), Mini DisplayPort to VGA Adapter, Apple Remote, Apple MagSafe Airline Adapter and the AppleCare Protection Plan. Build-to-order options for the 17-inch MacBook Pro include a 2.66 GHz Intel Core i7 processor, 8GB 1066 MHz DDR3 memory, a 500GB 7200 rpm hard drive, a 128GB, 256GB or 512GB solid state drive, antiglare display, Mini DisplayPort to DVI Adapter, Mini DisplayPort to Dual- Link DVI Adapter (for 30-inch DVI display), Mini DisplayPort to VGA Adapter, Apple Remote, Apple MagSafe Airline Adapter and the AppleCare Protection Plan. CUPERTINO, Calif., April 13 /PRNewswire-FirstCall/ — Apple® today updated the MacBook® Pro line with faster processors, powerful next-generation NVIDIA graphics and even longer battery life. The popular 13-inch MacBook Pro features the new NVIDIA GeForce 320M graphics processor for up to 80 percent faster graphics and a groundbreaking 10-hour built-in battery. * The new 15-inch and 17-inch MacBook Pro models feature Intel Core i5 and i7 processors and Apple's new automatic graphics switching technology that toggles seamlessly between powerful NVIDIA GeForce GT 330M and energy efficient Intel HD Graphics processors. "The new MacBook Pro is as advanced on the inside as it is stunning on the outside," said Philip Schiller, Apple's senior vice president of Worldwide Product Marketing. "With faster processors, amazing graphics and up to three more hours of battery life, the new MacBook Pro delivers both performance and efficiency." All 13-inch MacBook Pro models now include faster Intel Core 2 Duo processors, 4GB RAM, a 10-hour built-in battery and the new NVIDIA GeForce 320M graphics processor. With 48 processing cores, the new NVIDIA GeForce 320M is the fastest integrated graphics processor on the market, ideal for graphics intensive applications or high performance games. The 13-inch MacBook Pro is available in two configurations: one with a 2.4 GHz Intel Core 2 Duo and 250GB hard drive priced at $1,199; and one with a 2.66 GHz Intel Core 2 Duo and 320GB hard drive priced at $1,499. The new 15-inch and 17-inch MacBook Pro models are up to 50 percent faster than the previous systems. ** Using Intel's state-of-the-art 32 nanometer process, Intel Core i5 and i7 processors integrate the memory controller and Level 3 cache for faster access to system memory. Hyper-Threading technology improves data throughput by creating virtual processing cores, while Turbo Boost optimizes performance between the two processor cores, accelerating the system from 2.66 GHz to 3.06 GHz for intensive dual core tasks, and up to 3.33 GHz for single core tasks. All 15-inch and 17-inch models include two graphics processors, the new NVIDIA GeForce GT 330M for peak performance and Intel HD Graphics for energy efficient operation. More than twice as fast as the GeForce 320M, the powerful new GeForce GT 330M provides incredibly smooth, crisp on-screen graphics for the most demanding 3D games, creative software and technical applications. Apple's automatic graphics switching determines which graphics processor an application needs and switches instantly between processors to deliver peak performance and long battery life. Tightly integrated hardware and software allow the new 15-inch and 17-inch MacBook Pro to deliver 8 to 9 hours on a single charge. The new 15-inch MacBook Pro is available in three models: one with a 2.4 GHz Intel Core i5, NVIDIA GeForce GT 330M and 320GB hard drive at $1,799; one with a 2.53 GHz Intel Core i5, NVIDIA GeForce GT 330M and 500GB hard drive at $1,999; and one with a 2.66 GHz Intel Core i7, NVIDIA GeForce GT 330M and 500GB hard drive at $2,199. The new 17-inch MacBook Pro features a 2.53 GHz Intel Core i5, NVIDIA GeForce GT 330M and 500GB hard drive for $2,299. The MacBook Pro glass Multi-Touch™ trackpad now supports inertial scrolling, an intuitive way to scroll through large photo libraries, lengthy documents and long web sites. All MacBook Pros feature bright, LED-backlit wide-angle displays with a broad color gamut. The 17-inch MacBook Pro includes a high resolution 1920 x 1200 display, and the 15-inch MacBook Pro is now available with an optional high resolution 1680 x 1050 display. Customers can also upgrade their MacBook Pro with new 128GB, 256GB and 512GB solid state drives. As the industry's greenest notebook lineup, every Mac® notebook achieves EPEAT Gold status and meets Energy Star 5.0 requirements, setting a new standard for environmentally friendly notebook design. *** Each unibody enclosure is made of highly recyclable aluminum and comes standard with energy efficient LED-backlit displays that are mercury-free and made with arsenic-free glass. Mac notebooks contain no brominated flame retardants, are PVC-free and are constructed of recyclable materials. Apple uses advanced chemistry, intelligent monitoring of the system and battery, and Adaptive Charging technology to create a notebook battery that delivers up to 10 hours of wireless productivity on a single charge and up to 1,000 recharges. **** The built-in battery design results in less waste and depleted batteries can be replaced for $129 or $179, which includes installation and disposal of your old battery in an environmentally responsible manner. All Macs come with Mac OS® X Snow Leopard®, the world's most advanced operating system, and iLife®, Apple's innovative suite of applications for managing photos, making movies and creating and learning to play music. Snow Leopard builds on a decade of OS X innovation and success with hundreds of refinements, new core technologies and out of the box support for Microsoft Exchange. iLife features iPhoto®, to easily organize and manage photos; iMovie® with powerful easy-to-use new features such as Precision Editor, video stabilization and advanced drag and drop; and GarageBand® which introduces a whole new way to help you learn to play piano and guitar.